In the modern world of ours, the shifts in lifestyle choices have created various physical and mental health issues. The diseases like high blood pressure, angina, diabetes, migraine, hypertension, stress and other psychological problems are getting hold of the individuals who have imbalance in their physical-mental-emotional well being resulting in hindrance in the development of the individual and the at a broader level the society as well. In the attempt to pace up one’s efforts, often the well-being is ignored and a temporary refuge is taken by consuming alcohol, smoking, OTC (over the counter) drugs etc. eventually accumulating harmful chemicals in the body manifested as unfavorable behavior and lower life expectancy. Our ancient scriptures have fascinating and uplifting remedies for the removal of any physical-mental-emotional imbalances in natural way. Rudraksha, which is the sacred seed of the Rudraksha tree have unique properties that renders wholesome effects. The Rudraksha beads comes in the variety of faces (mukhi) 1-21, have tremendous power that eliminates the imbalances in one’s being and provides divine grace. Each mukhi Rudraksha has its specific array of benefits. 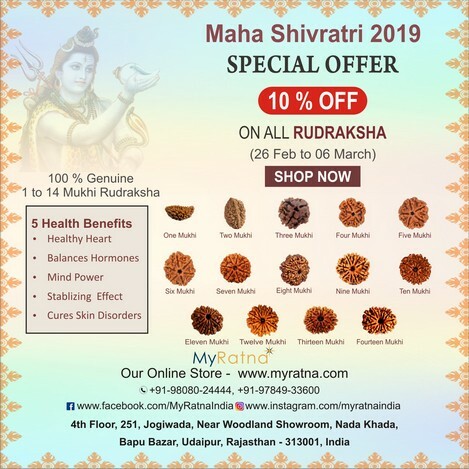 The most important aspect to consider before buying Rudraksha is that it must be genuine because you will not get any benefit from the imitated Rudraksha. Remember to buy authentic Rudraksha from a trusted seller. 1.Healthy Heart:- The magnetic properties of Rudraksha are known for its dynamic polarity (ability to change its polarity). The heart beats and the circulation of blood creates a magnetic field around the body. The bio-electricity is thus polarized in a unique way by the induced magnetic field when Rudraksha touches the body, opening up the blood vessels for optimum functioning. Stabilizes heart, removes blockages and controls blood pressure. 2. Balances Hormones:- The stabilizing and calming effect of Rudraksha on body and senses creates organized pattern for hormone secretion and functioning. Assists in coordinating the components and processes of the body together with the environment. Results in balanced growth. 3.Mind Power:- The harmonizing effect of Rudraksha removes the stress hormones which provide a wider field for the brain to operate effectively and efficiently towards desired action without any overstimulation of cells which enhances the memory. 4.Stabilizing Effect:- Physical or mental activities tend to increase the heart rate and other physiological functions which simultaneously builds the amount of useful energy if left unchecked will drain out. The Rudraksha keeps check of the energy fluxes and stores the excess amount of energy serving as a battery. Thereby stabilizing the energy patterns which enhance confidence and better feeling. 5. Effective in Skin Disorders:- The anti-inflammatory and anti-microbial effect of Rudraksha together with its harmonizing tendency is beneficial in skin disorders. Drinking the energized water in the morning empty stomach prepared by Rudraksha bead when kept overnight in Copper Pot filled with water is beneficial in treating skin diseases.